Find what you're looking for faster. Search this site. If so, you may be wondering (worrying?) whether a pit bull is the right dog for you. There is much to consider when choosing any breed of dog--cost of care, activity level, grooming requirements and so on. Pitbull Terrier owners also have to contend with the stigma and controversy surrounding their choice of dog. To be sure, owning a bully breed dog is not for everyone. 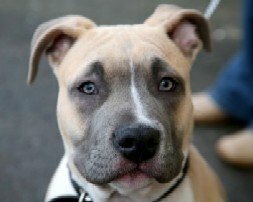 Away from the heat of publicity though, statistics show that APBT temperament test scores are actually better than any number of dog breeds currently considered "great family pets". And it has been documented that "bite incidents" are significantly over-reported due to faulty breed identification. to deliver information on training, adoption and getting the most enjoyment from your relationship with your new (or old) best friend. Click the arrow on the screen to view. Be sure to check out our free, monthly ezine--Bully For You!